Terrapins are a small breed of turtle native to the southeastern region of the United States. Like turtles, they can become household pets. However, as with all pets, they must be appropriately treated an cared for to stay in good health and survive outside their natural, wildlife habitats. If you choose to own a terrapin, you can set up a habitat that will keep it comfortable and healthy so that you can enjoy a long-term relationship with your new pet. Purchase a transparent aquarium for your terrapin. For a baby terrapin, the tank can be as small as 18 inches by 12 inches by 4 inches. For an adult terrapin, the tank can be no smaller than 25 gallons. Because terrapins grow rapidly, you will need to upgrade the size of your tank throughout your terrapin's life to ensure it's comfortable in its habitat. Place a water heater in the tank and set it to not less than 75 degrees Fahrenheit and no more than 80 degrees Fahrenheit. Because terrapins are reptilian, they are cold-blooded. Their internal temperatures and their activity levels correlate directly with the temperature of their habitat. Keeping the tank too cold will cause them to become overly sluggish and inactive. Place a water filter in the tank. This will help clean the water and prevent your terrapin from becoming sick by swimming and living in filthy conditions. Though the filter will greatly aid in keeping the water clean, periodically, you must empty the tank and clean it manually using water and a mild detergent. 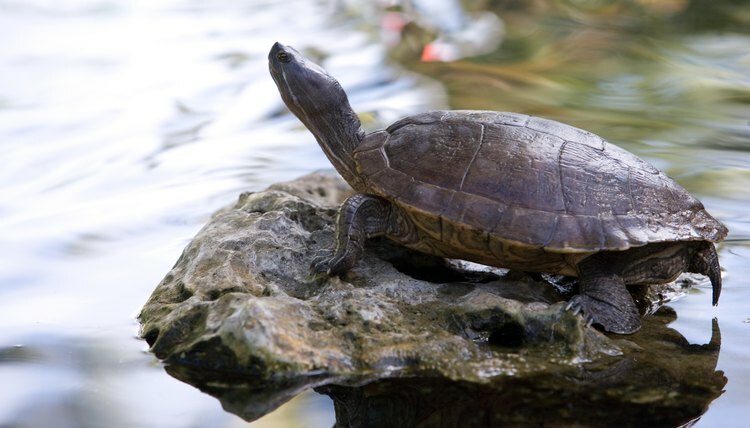 Place large stones in the tank so that your terrapin can climb out of the water to bask. For the terrapin to bask, install a lamp, either ultraviolet (UV) or fluorescent, over the tank to provide ample warmth for your pet. Decorate your tank as you desire. However, be sure to allow enough space for the terrapin to move about freely. If you use larger decorations, invest in a larger tank to accommodate them.